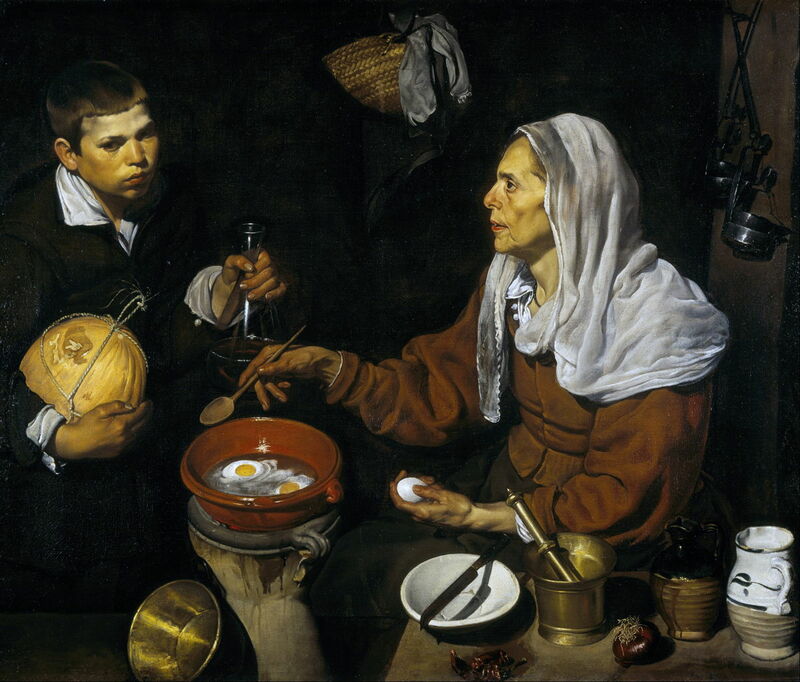 Diego Velázquez (1599–1660), Old Woman Frying Eggs (1618) , oil on canvas, 100.5 x 119.5 cm, Scottish National Gallery, Edinburgh, Scotland. Wikimedia Commons. Diego Velázquez (1599–1660) is most famous for his portraits, but several of his most important works – his landscape sketches of about 1630 from Italy, Las Hilanderas (The Spinners) from about 1657, and Las Meninas from 1656 – are very different and profoundly fascinating. In this series, I am going to try to get to grips with that Velázquez, who was so much more than a portraitist and painter to the court. This article starts the series by looking at his training and first signs of brilliance in bodegones, lightly amusing genre paintings. Velázquez was born most probably in May 1599, and baptised on 6 June that year in Seville. His parents were from the lesser nobility. His father’s name was Juan Rodríguez de Silva, and when Diego was admitted to the painters’ guild later, he signed his name Diego Velázquez de Silva, but for much of his life was simply known as Diego Velázquez. Such flexibility in naming was quite common at the time in Spain. Velázquez was an able student in languages and philosophy, but from an early age seems to have been destined to become an artist. He is reported to have started his training with Francisco de Herrera, but the story is told that he was soon frightened off by his teacher’s temper. The first reliable record of him starting training as an apprentice was in the workshop of Francisco Pacheco in September 1611, when Velázquez was twelve. He seems to have spent five years working and learning there, in Seville, and on 14 March 1617, he was made a member of the Guild of Saint Luke. Just over a year after attaining guild membership, which was essential for him to paint for church and public commissions and to take in his own apprentices, Velázquez married his teacher’s daughter. Presumably still receiving guidance and advice from his father-in-law, he embarked on painting bodegones. At the time, a bodegón was a low eating place, much like a roadside cafe, and the typical bodegone painting showed ordinary people in a composition involving food and drink, such as are normally considered as genre works today. Diego Velázquez (1599–1660), Musical Trio (1617-18) , oil on canvas, 87 x 110 cm, Gemäldegalerie der Staatlichen Museen zu Berlin, Berlin, Germany. Wikimedia Commons. 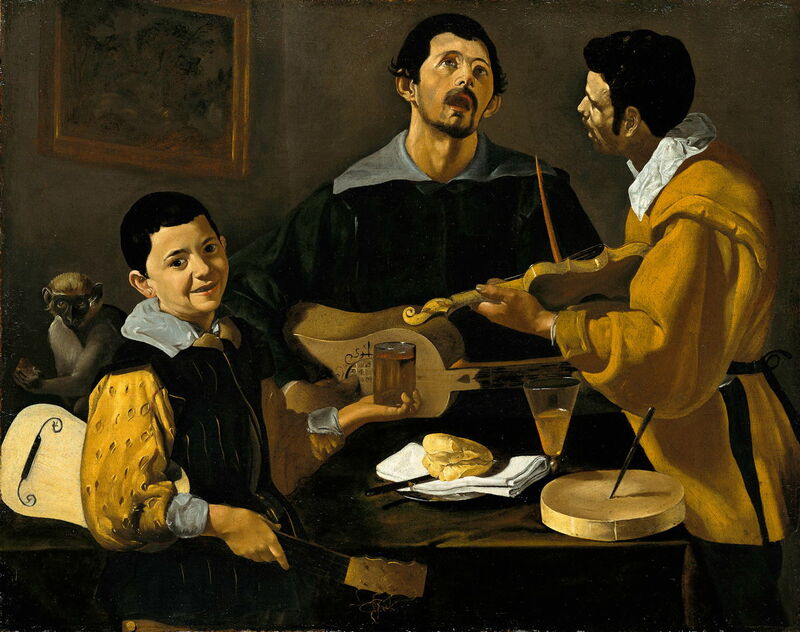 Musical Trio is thought to be Velázquez’ earliest surviving painting, from 1617-18, and is a tentative composition of a musical variant of the bodegone. He adds some novel touches, such as the small monkey sat at the left, and an undecipherable painting hanging on the wall. One aim of the bodegone was to showcase the painter’s skills, and his depiction of glassware and liquids is very promising for someone so early in his career. 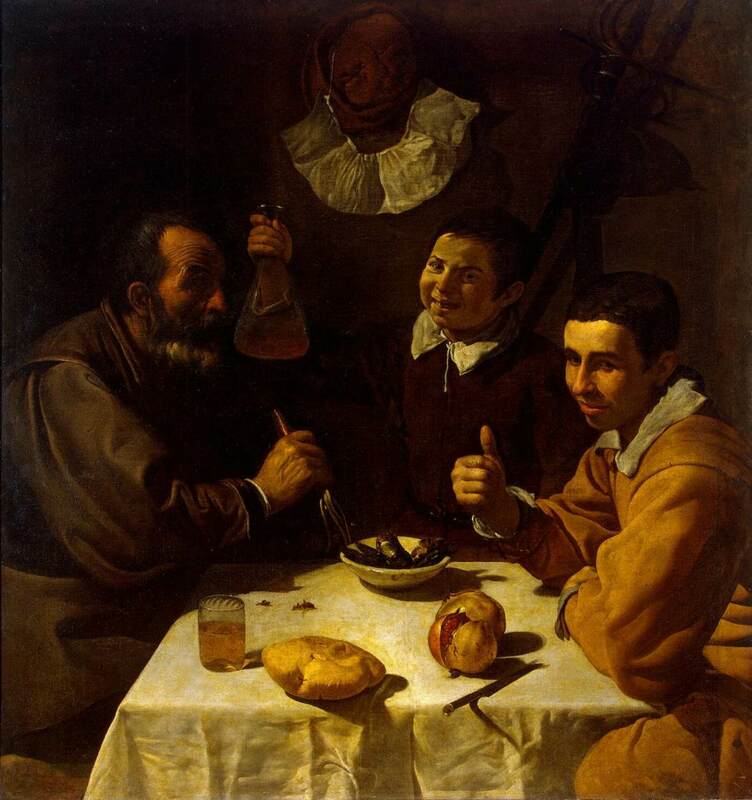 Diego Velázquez (1599–1660), Three Men at Table (The Luncheon) (c 1618) , oil on canvas, 108.5 x 102 cm, Hermitage Museum Государственный Эрмитаж, Saint Petersburg, Russia. Wikimedia Commons. This was followed by Three Men at Table (The Luncheon) in about 1618. Sadly, this painting in the Hermitage is the worse for its age, and I show below an image which has been processed digitally to make it more readable. These three men are sat around a table on which there is bread and pomegranates. The older man is holding a turnip, and all three appear to be enjoying their meagre lunch. By far the most impressive of these early paintings is Old Woman Frying Eggs which is dated 1618, and still in excellent condition. Velázquez’ composition has improved greatly, and the face of the old woman is superb. He includes a much wider range of reflective and transparent objects, which are shown better in the detail below. The bright reflections of light on the flask of wine, the cooking pot for the eggs, and the mortar and pestle, are almost perfect, and his handling of shadows of these objects is impressive. Even at this early stage, his brushwork in fine detail is quite painterly, a trait which was to develop and attract criticism later in his career. Diego Velázquez (1599–1660), Old Woman Frying Eggs (detail) (1618) , oil on canvas, 100.5 x 119.5 cm, Scottish National Gallery, Edinburgh, Scotland. Wikimedia Commons. Diego Velázquez (1599-1660), Kitchen Scene with Christ in the House of Martha and Mary (c 1618) , oil on canvas, 60 x 103.5 cm, The National Gallery (Bequeathed by Sir William H. Gregory, 1892), London. Courtesy of and © The National Gallery, London. 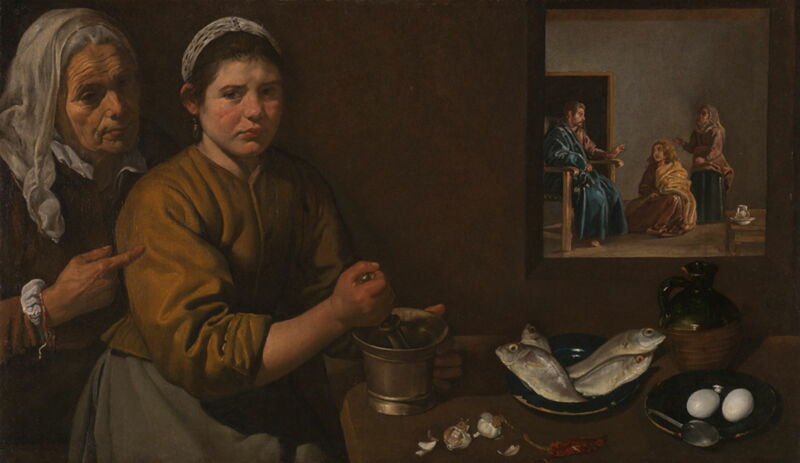 In the same year, Velázquez tried to mix religious narrative in a bodegone, in Kitchen Scene with Christ in the House of Martha and Mary. In the foreground, the two women are busy preparing the food in their kitchen, in true bodegone style. 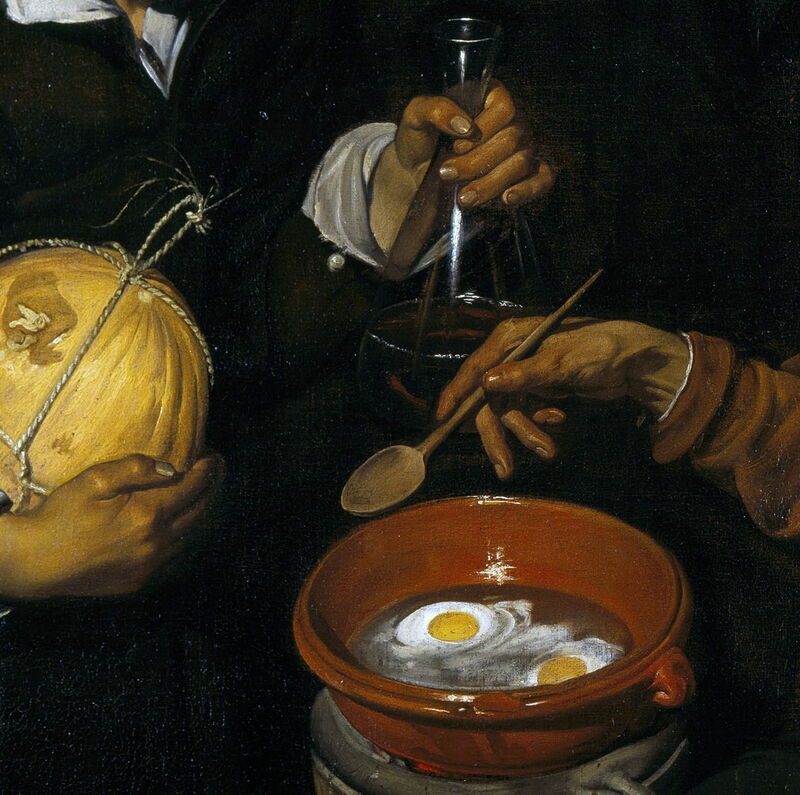 Common to his earlier paintings are the mortar and pestle and eggs. Then seen either in a framed mirror, or perhaps through an internal window such as a serving hatch, is the religious narrative of Christ with two women, one kneeling at his feet. Careful examination of the four women suggests that none is duplicated, and this in turn implies that the younger woman in the foreground is Martha, who looks miserably towards the viewer, while Mary is the figure sat at the feet of Jesus in the mirror. 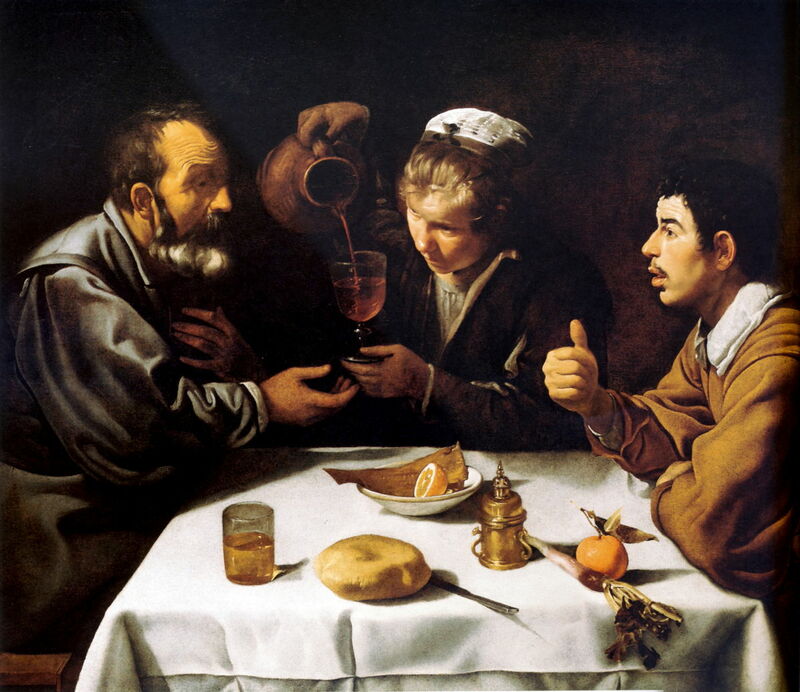 Although relatively unusual in Spanish bodegone at the time, casting a religious scene within such genre food scenes was well-known in their Dutch Golden Age equivalents. Diego Velázquez (1599–1660), Peasants at Table (1618-19) , oil on canvas, 96 x 112 cm, Szépmüvészeti Muzeum, Budapest, Hungary. Wikimedia Commons. Slightly later, in 1618-19, Velázquez reworked the Three Men at Table into this Peasants at Table, which is in better condition and better composed and executed. It is more tightly cropped on the three figures, with no puzzling background detail to interrupt. The figures are engaging with one another rather than the viewer, and the man whose head is shown in profile at the right is painted very convincingly. These bodegones were successful in drawing attention to Velázquez’ talent and skill. By 1620, he had started to receive commissions for portraits, and his later bodegones show his career starting to develop. This was just as well, as Velázquez’ wife Juana gave birth to their first child, Francisca, in the early summer of 1619. He now had a living to make for his family. This weekend, to provide some background to this series on Velázquez, I will look at painting in Spain at that time. José López-Rey and Odile Delenda (2014) Velázquez The Complete Works, Taschen and the Wildenstein Institute. ISBN 978 3 8365 5016 1. Posted in General, Life, Painting and tagged bodegone, de Herrera, Pacheco, painting, Spain, Velázquez. Bookmark the permalink. Why doesn’t the Open File dialog show tagged folders?